Next steel roofing is attached allowing for a 1" overhang on all sides except the peak, that is left 2"s short for ventilation. The panels are secured with galvanized screws with rubber washers. A piece of the roofing is bent to the angle of the roof and applied as a cap so that it overhangs the panels at the peak! Water proof. Pretty good explanation but a little short on photos for those who are more challenged than others. How did you cut the metal sheets? What does the framing look like underneath? "Page 4 of 6 - Patching Together Good Instructions"
This is a single photograph and a few lines of instruction for putting a metal roof on a coop build in progress. Each step is very good but really hard to use without the context of the other pieces. In order to get good instructions for the full build, or to complete a current phase, the reader has to search fr all of the other pieces. Finding the pieces one step at a time is very tedious and confusing. The details and pictures are good. Together, they would be excellent! This coop has a really neat design that not only looks good but functions well as well. 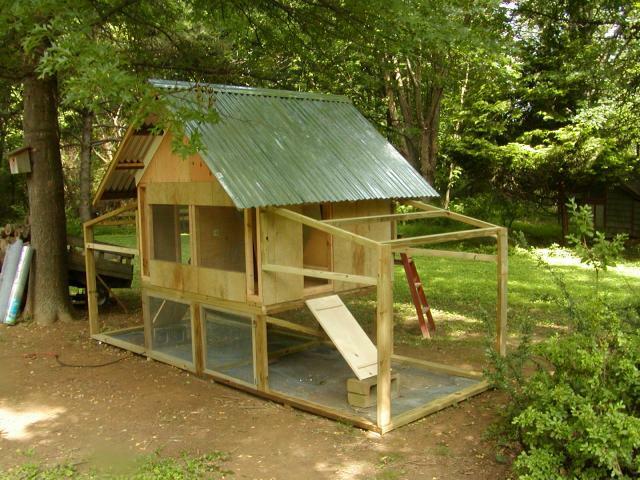 The run is attached very nicely and the coop has sufficient ventilation. I don't see much room for improvement on this coop except for maybe some more floor space if you plan on having a larger flock.